Most investors are judging this year’s performance by looking directly at February 2018 and seeing how a CTA fared. 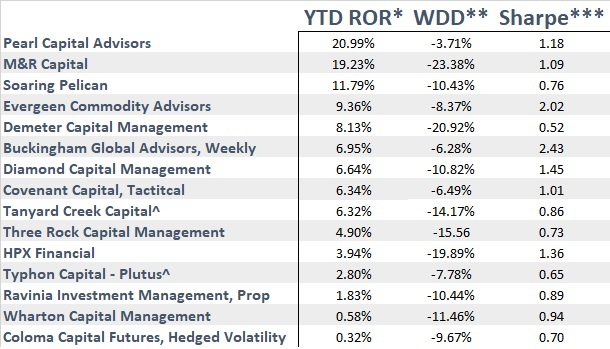 Volatility traders’ performance was either feast or famine that month, and some notable names that thrived were: Pearl Capital, Buckingham Global Advisors, Covenant Capital, Ravinia and Coloma Capital. All the mentioned names trade volatility either by trading VIX futures, S&P options or a combination of the two. In addition to volatility traders, Soaring Pelican, a S&P futures trader, was also able to take advantage of the S&P downtrend and go short S&P futures. In addition to February 2018 being a focal point for this year, this year has also seen a comeback from livestock and grain traders. CTAs, such as, M&R, Demeter Capital, Tanyard Creek, and Typhon Capital Plutus outperformed their peers. The grain sector remains challenging, therefore, having exposure to livestock can be a good supplement and diversifier in a CTA portfolio. With five months remaining in 2018, we don’t see a major shakeup taking place in the above list. A pre-harvest grain rally may bring more grain sector CTAs to this list, but that is not looking so likely at this point. Some distressed markets, such as, coffee and metals may provide opportunities to CTAs that are not included on the list, as well.